Understanding that her more delicate husband would never survive the Civil War, Constance Thompson takes up the moniker Ash, disquises herself as a man and joins the Union army in his stead. Inspired by true stories of women who wore blue and gray, readers should not dismiss Neverhome as one novel among many. War is an inexhaustible setting for writers, so near death as to make every facet of life available to explore, but this story is told by someone who is dressed as and must act as a man, but sees through the eyes of a woman. Neverhome is an eloquent and potent novel. Laird Hunt's dazzling new novel throws a light on the adventurous women who chose to fight instead of stay behind. It is also a mystery story: why did Ash leave and her husband stay? Why can she not return? What will she have to go through to make it back home? In gorgeous prose, Hunt's rebellious young heroine fights her way through history, and back home to her husband, and finally into our hearts. 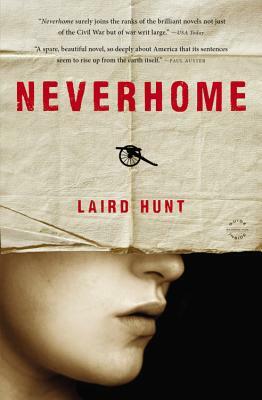 Laird Hunt is the author of several works of fiction and a two-time finalist for the PEN Center USA Award in Fiction. A former United Nations press officer currently on the faculty of the University of Denver's creative writing program, he and his wife, the poet Eleni Sikelianos, live in Boulder, Colorado, with their daughter, Eva Grace.